Pointy « I think I feel another exclamation mark coming on. These are single-edged traditional Japanese knives, the wide-bladed one being a ‘deba’ for general chopping, and the long thin murder-weapon-type-thing is called a ‘yangiba’. Apparently it’s good for sushi making, both working with the fish, and also slicing rolls. Obviously this will have to be tested! I resisted the temptation to buy the various ‘pro’ Japanese knives, which are made from exotic steels, have HRC numbers approximately that of diamond, or have watered / Damascus blades, since they’re all punishingly expensive. 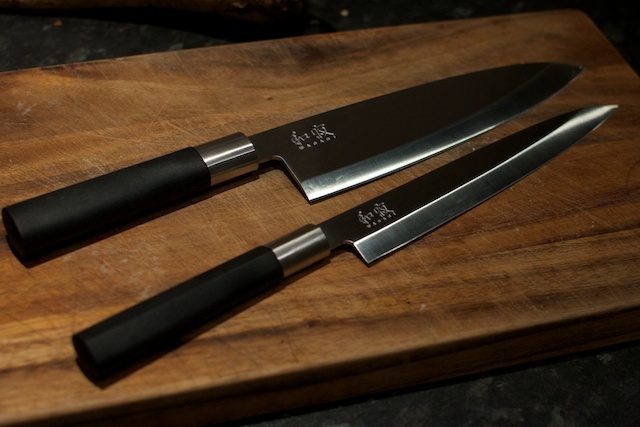 So far I’m also holding off on the ‘nakiri’, which is rectangular cleaver-esque thing which is apparently the best for chopping up veg (and zombies, I suspect). Posted Thursday, March 17th, 2011 under geek, toys.